Since 13 September 2017 Royal Vegas Online Casino has stopped accepting Australian real money gamblers at their casino. However, they didn’t want to leave their players with no place to enjoy the great games that they offer on their real money online casino. As a result, they have launched new play-for-fun casino online for Australians. Play Royal Vegas gives Aussies a platform to play the best casino games for free without any need to deposit money into a casino account. This will not break any of laws especially the recent amendment bill which resulted in Royal Vegas Casino exiting the Australian online gambling market. 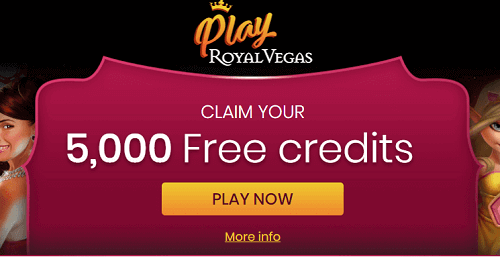 Play Royal Vegas offers Australian casino players an avenue to play a large selection of casino games such as pokies, blackjack, and roulette for free. The site is compatible with mobile gaming so that Aussies can access it from their smartphones and tablets. Players have to register with the casino site to be able to access the casino games. There are different levels of playing, and with each level, various kinds of games are unlocked. Aussies will also be able to make in-app purchases to fast track through the different levels. Furthermore, the in-app purchases allow players to unlock bigger rewards. Details such as your name, address, and password will be required when you register. Agree to the terms and conditions, which you should read before accepting, and then a registration confirmation will be sent. Once you have the confirmation, then click on the Collect & Play button and the pop-up will appear on the confirmation message. This will activate your welcome bonus which is 5 000 virtual credits and then start playing. Even though there are a lot of online casinos that are exciting and have exited Australia, Royal Vegas is offering players a place to enjoy casino games. However, the games will not be for real money it is a better option than playing at blacklisted and unregulated casino sites. Since it is Royal Vegas casino that has created this platform, Aussies can be sure that it is safe and secure.